Declaring Reason is a collaboration between Museum Meermanno and the KABK – Royal Academy of Arts in the Hague that presents the works of third-year Graphic Design students who investigate the history of parliamentary democracy by means of books and manuscripts from Museum Meermanno’s collection. 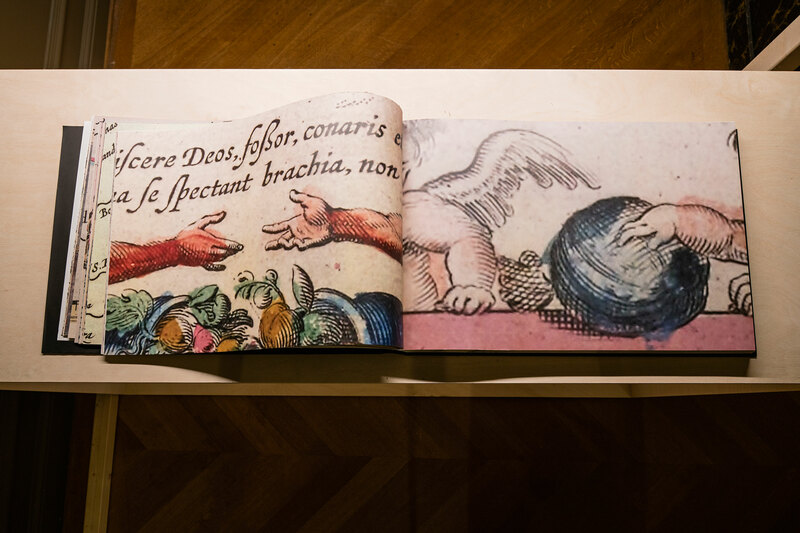 The exhibition juxtaposes books from the museum’s historical collection with innovative new impressions by students, and is on show for the public from 3 June until 24 September 2017. Declaring Reason was tutored by Niels Schrader and Lauren Alexander from the Royal Academy of Arts and included theory component tutoring by Maarten Cornel. Guest critics were Alice Twemlow and Olivier Arcioli. Daniel Hernández and Dóra Kerekes have created a digital platform, which compares selected words from Diderot’s Encyclopédie with definitions from Wikipedia. The main objective is to determine, by means of word frequency analysis, the various agencies and concerns of different historical periods. The comparison makes apparent that the common definition of truth is slowly but constantly changing. 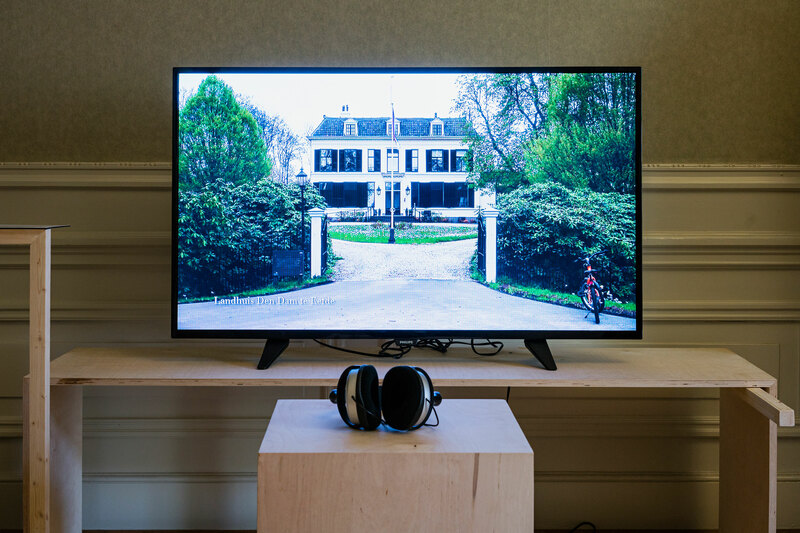 Hilde Barwegen’s video documentation Counterfeit Knighthood zooms into the living and working environment of Dutch nobleman Joan Derk van der Capellen tot den Pol by carefully recording his remaining physical traces throughout the Netherlands. Idyllic, peaceful scenes of Dutch village life where radical and influential ideas were born, are contrasted with implicit luxurious wealth deriving from Dutch colonialism of the same period. This raises the question about Van der Capellen tot den Pol’s true motives for starting a revolution against the political elite of his time. Asya Sukhorukova and Lin Ven investigated the distribution of pamphlets as political commentary that occurred during the so-called “pamphlet wars” in the Netherlands in the eighteenth century and how they can be compared to the public disputes that take place in the comment sections of today’s social media channels. Declaring Word critically reflects on the ease and lack of concern that citizens have for public commentary. It seems that, unlike in the past, written self-expression is now much more easliy published without the actual necessity to take moral responsibility. The society Rousseau envisioned is coordinated and unified by the so-called “general will” that aims at the common good or common interest (as opposed to the “individual” or “particular” will). With their work, Antonia Brell and Rebecca Rui seek to create a space of playful, social interaction in which the audience can put Rousseau’s vision into reality by paraphrasing or rephrasing passages from The Social Contract. Presented with a set of words, the visitors are encouraged to formulate their own opinion on how society is currently shaped and upload their statement to the website www.we-construct.net. In their work Kay Pisarowitz and Marika Seo respond to Spinoza’s call for secular humanism and free moral judgment by testing the general boundaries of freedom of speech in the context of satire. Since the dividing line between political correctness and censorship is near imperceptible, Do Not Cross! enjoys the idea of luring its beholder into a false sense of objectivity. It is set up as a life-size flow-chart that allows people to follow a sequence of continuous choices and become aware of how easily a joke can “cross the line”. Despite its scale, the project only displays a miniscule fragment of what is in fact an endless debate. Taisiia Reshetnik and Theresa Scherrer analysed the constitution of all European countries based on selected parameters like date of publishing, prioritised topics, language patterns and structure. Their thorough research into formal aspects of constitutional texts has resulted in their own visual interpretation of European national identity in the form of flags. In their film Fifth Grade Iris Lam and Lou Top document their self-initiated lesson for ten-year-old children at a primary school in the Hague in order to reflect on Rousseau’s pedagogical thoughts on education as key to becoming a committed demos. The documentary not only reveals the pupils’ capacity to translate an abstract political mandate into concrete group behaviour but also nicely illustrates the first signs of growing social responsibility at an early age. Elizaveta Glukhova and Jungeun Lee explored Spinoza’s ideas on the boundaries between individual moral values and general law. In his political paper “A Political Treatise”, Spinoza explains the dilemma within installing, for the benefit of all, a system of obedience and governance while simultaneously trying to preserve as many personal freedoms as possible. During their quest to find out more about jurisprudence and morality, the students asked several interviewees to voice their personal opinions and describe the challenges in developing an instructive legal framework. The resulting interviews were presented as a multi-screen installation. Saber Javanmard is fascinated by the mythical illustrations of angels and sea monsters, naval battles and treasuries that illuminate the maps inside Atlas Maior. In a book of exactly the same dimensions as the original atlas, Saber zooms into the details of medieval cartography in order to uncover the political dimensions of seemingly insignificant, decorative map elements. It appears, namely, that these particular illustrations depict primary political behaviour such as assembling, debating, voting, governing and lobbying. Nóra Békés and Wannes Vrijs focus on Spinoza’s radical seventeenth-century ideas about religion and society. Advertising boards with different quotes by the Dutch philosopher were put up in public spaces and busy shopping streets in the Hague in order to spread Spinoza’s warnings. While Spinoza warned in his Tractatus Theologico Politicus about the risks of misleading the public through religion, Békés and Vrijs remind their audience about the dangers of capitalism as a new cult. Joan Derk van der Capellen tot den Pol’s motivation to write the pamphlet Aan het volk van Nederland is strongly based on a sense of nostalgia, fondly referring to the period of Batavian settlement. Rudi van Delden and Jan Egbers take this as a starting point to critically address contemporary politicians' nostalgia for the industrialized 1960s. It seems that in today’s political landscape, both the left and right look back on a time when the ever-increasing privatization of today was still far away and sovereignty was considered authority rather than responsibility. The question remains as to what is left out of the picture when longing for the past is being put to use as a political instrument? In their work, Vanessa Eck and Rebecca Joly investigate how Jean Jacques Rousseau’s concept of the “general will” is applied within the European voting system. They created detailed timelines that document the events of electoral periods in France, Belgium, the Netherlands and Germany. Social Environments is a printed glossary that compares Rousseau’s The Social Contract to the terms and conditions of modern social media communication. Anna Lenczewska and Natalia Vishnevskaia bring attention to the similar and dissimilar connections between two social environments from different time periods and shift the term social contract towards a very new meaning. Niels Schrader (1977, Caracas, VE) is a concept-driven information designer with a fascination for numbers and data. He is founder of the Amsterdam-based design studio Mind Design and member of the AGI – Alliance Graphique Internationale. Next to his design practice Schrader has been lecturing at the Delft University of Technology, ArtEZ – Academy of Art & Design in Arnhem and Willem de Kooning Academie in Rotterdam. Since January 2013 he is co-head of the Graphic Design department at the Royal Academy of Art in The Hague. In his work, Schrader plays the role of both a mediator and a designer. He considers communication to be an interactive process that requires participation through questioning. See further: www.minddesign.info. Lauren Alexander (1983, Cape Town, ZA) holds an MDes from the Sandberg Instituut, Amsterdam (2008) and an MFA from the Dutch Art Institute, Arnhem (2011). In 2009, she initiated Foundland Collective, together with Ghalia Elsrakbi, a design, research and art practice, based between Cairo and Amsterdam. The collective’s work draws on graphic design, art, writing and research in order to develop critical and imaginative reflections on political and social issues, particularly related to the Middle East. See further: www.foundland.info.